Are there dead unicorns on the horizon? Billion dollar companies aren't immune to market turmoil. The tech world calls them unicorns -- privately held companies valued at $1 billion or more. There are roughly 140 of these companies, and they're raising more and more money. Many are funded by nontraditional investors like hedge funds and mutual funds, with an emphasis on growing the company's customer base, rather than turning a profit. But investors see returns when a company goes public -- and the outlook for tech initial public offerings is murky, at best. There have been just 15 tech IPOs this year, according to market research firm Renaissance Capital. That's the lowest, so far, since 2008. And tech IPOs -- including Etsy (ETSY) -- were among some of the worst performing in the second quarter of 2015. Most agree that there will be some type of correction in the private market. Companies that have yet to make money, are spending far more than they're bringing in, and are focused on Silicon Valley's "growth at all costs" mentality may not weather an economic storm. Venture capitalist Bill Gurley, an early investor in Uber, predicted that some unicorns would die this year. E-commerce site Fab.com -- once valued at close to $1 billion -- suffered mass layoffs before it was acquired for an undisclosed amount in March. Evernote, valued as a unicorn in 2012, laid off 47 people and closed three of its global offices this week. Upfront Ventures' Mark Suster warned this week that billion dollar valuations are hardly an emblem of status or safety. "Please know that this isn't the success by which to measure yourself," he wrote. After all, a valuation is based on predictions about a startup's potential. It doesn't mean a startup has $1 billion. It means people think it is worth $1 billion. 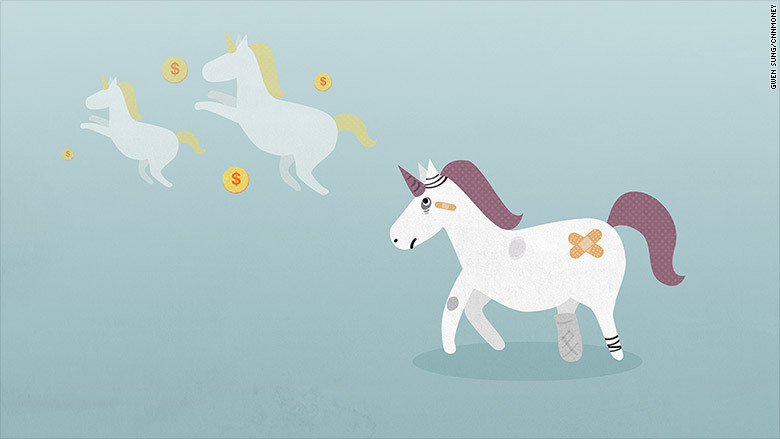 A recent report from research firm PitchBook points to some unicorns that might be in trouble in a market downturn. Factors like when a company raised its last round -- and whether it is successfully generating revenue -- can be telling. A unicorn like Genius -- one that PitchBook names -- hasn't announced any new funding in over a year. In July 2014, it brought in $40 million (and earned unicorn status). Genius, which lets users annotate lyrics and historical texts online, could run into trouble unless it starts generating revenue. A spokesperson for the company declined to speak on the record. Is the company past its IPO prime? Some unicorns, like 14-year-old Bloom Energy and 8-year-old file hosting service Dropbox, have yet to go public. Will they ever? According to Adley Bowden, senior director at PitchBook, a debt financing round -- like the $500 million one Dropbox raised in 2014 -- often signals that the company may soon IPO. Yet it hasn't. It's not the first time analysts have been skeptical of Dropbox. A source close to the company said it has been profitable since its Series A in 2008. But it watched its competitor, Box (BOX), struggle in the public market after it IPOed in January. Dropbox has introduced standalone applications (like Carousel) that have had little traction. It also faces new competition in the shift away from file-sharing services to platforms like Slack. "They're not going to suddenly disappear," said Bowden, who added that companies like this may struggle to raise future rounds at the same or higher valuation. Does the company have a plan if -- and when -- funding runs dry? One unicorn, Nextdoor, raised a hefty round of $110 million in March, bringing its total funding to $200 million. The company, a social networking platform for neighborhoods has -- not atypically -- focused on scale rather than generating revenue. But that's not necessarily a bad thing. Nextdoor has grown tremendously since 2010 when it had just 170 neighborhoods on its platform. Now it has 75,000, out of an estimated 150,000 in the U.S, according to cofounder and CEO Nirav Tolia. Tolia said that a fear of running out of cash is a non-issue for his business because there is an obvious, lucrative revenue stream he could turn on at any point. Over 60% of customers use Nextdoor to find local service providers, so targeted advertising is a natural fit. Tolia said they raised money because of investor interest -- not because of need. "The best way to prepare is to have a significant war chest," said Tolia, noting that theirs could support an economic downturn that lasts for years. Gurley -- who is notorious for warning of a bubble -- was the company's first investor. "We agree that there will be some kind of rationalization in the market -- but it's not the companies that have $100 million in the bank," he said. "It's the companies that are burning in excess of what they raised."